Justine graduated from Simmons University in 2013 with a BS in Exercise Science and in 2015 with a Doctorate of Physical Therapy. 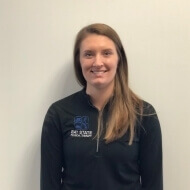 She began her career at Bay State Physical Therapy in South Boston and has enjoyed working with each patient to reach their fullest potential. Justine has worked in a variety of settings with diverse patient populations, which has allowed her to continuously foster a patient-therapist relationship based on trust and communication. She believes the key to pain-free mobility is through education, developing individualized treatment plans, and promoting overall well-being. Justine is certified as a Herman and Wallace Pelvic Floor 1 provider and continues to work with females who present with urinary incontinence, pelvic pain and dyspareunia, and/or other pelvic floor dysfunctions. She also enjoys working with infants and young children, including those who present with symptoms of torticollis. Justine played soccer throughout her collegiate career and continues playing in local leagues. She enjoys running half and full marathons and completed the New York City Marathon in 2017 on behalf of the Human Rights Campaign and again in 2018.